There's not much movement this week as it looks like the coaches have solidly decided on an entrenched top-7. As such, we'll look this week at what the chances are for the lower teams of the top-10 to make it out of their respective conferences and into the Final 8. No. 8 Dalhousie: The best thing for the Tigers would be to continue their late surge behind the play of stars Joe Schow and Simon Farine, who have helped establish Dal as part of the second-tier of AUS teams (with X) behind Cape Breton. They've won five in a row after a slow start to 2011 (though that was mainly through three losses to the Capers, and though it's still mathematically possible for them to get the no. 1 seed in the AUS tournament (I stress mathematically), the Tigers have upset team written all over them. No. 9 Windsor: Remember all the way back when some idiot said Laurier was right there with Windsor to challenge Lakehead in the OUA West? I don't think anyone is making that case anymore. A Windsor turnaround that's come mostly at the expense of the Golden Hawks (especially that unreal 33-point road win - who does that?) has perhaps made a few people reconsider the Lancers as Final 8 contenders. To make it to Halifax, they'll need to keep getting Big Boy (capital B) performances from Lien Philip, their second-year centre who went for 20 points and 13 rebounds against Laurier and who most teams simply can't match up with in the paint. Oh, and for Andre Smyth to smile a bit. Cheer up, Andre. Maybe this dunk by Monty Hardware, as Mark Wacyk pointed out, will cheer him up. No. 10 Laval Rouge et Or: To me, what Quebec team makes it to Halifax in March is a bit of a crapshoot right now. Laval (9-4) went 2-2 in their season with Concordia (10-4), but 3-1 over McGill, who the Stingers are 1-2 against. As a five-team league, it's tough to put too much stock into games like Friday's, which saw Concordia win. The playoff and home court advantage scenarios are wild, and with some strong parity between the league's top three teams right now, it's too much to guess who will heading east out of the Q.
UBC's Brent Malish tells the Province's Howard Tsumura his recent play may have been "Larry Bird-esque." Carleton's Elliot Thompson has gone from the Dave Smart Doghouse to being a regular contributor in wins, says the Daily Gleaner's Chris Fox. The Sheaf's Devin R. Heroux looks at the Saskatchewan Huskies' dominance of lesser foes this year. Ottawa's "Worldwide" Warren Ward went 16-of-18 for 41 points in a win over Toronto. Laurier's Kale Harrison and Max Allin went a combined 3-for-20 in a crucial, brutal loss to Windsor that may have turned around their season's fortunes. Carleton - Have yet to be truly challenged by an OUA foe. UBC - 16 in a row. Yawn. Saskatchewan - Two games left to prepare for the playoffs. Cape Breton - Win streak stands at 9 and can wrap up the first seed with just one win. Trinity Western - The playoff preparations have already begun for the Spartans. Lakehead - The pack have officially taken down the OUA West regular season title. 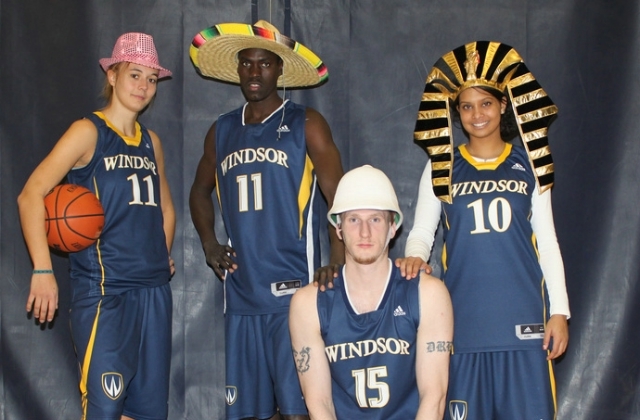 Windsor - Can lock up a bye with wins over Mac and Guelph. St. FX - Is anyone else excited for the AUS Tournament? Yes? Okay sweet. Concordia - My top-10 QUBL team switches like two defenders on a Kyle Desmarais pick-and-roll. The Star story linked at the top of this post as since disappeared, along with its picture, but I have to say that Silly Hats seems to please Jessica Clemencon more than Four Players And Coach Posing With Hands On Hips did last year.